Brightness is the first thing that comes to mind when a DJ is looking for a light that will do the ever popular “name in lights” monograms clients are asking for. This of course is followed by versatility, image throw, power consumption, and lastly, the price. On our bench today we have the CHAUVET® Gobo Zoom™ LED 2.0. A lightweight fixture that shows promise when it comes to being a bright and affordable low powered LED gobo projector. 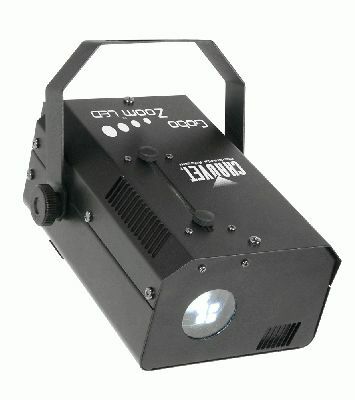 In comparison to a conventional 250-watt halogen powered gobo light, the CHAUVET® Gobo Zoom™ LED 2.0 stacks up quite well. In a side-by-side comparison with a Martin PR1, the CHAUVET® Gobo Zoom™ LED 2.0 with its 15-watt LED light source gives the PR1 a run for its money. Using only a 10th of the power, the CHAUVET® Gobo Zoom™ LED 2.0 produced an image just as crisp, clean and bright. One small adaptation is setting the CHAUVET® Gobo Zoom™ LED 2.0 a little closer to the wall you are projecting on than the PR-1, but this is something a DJ can work with since the positives of this light truly make it shine. Let’s go over a few of the pluses the Gobo Zoom LED 2.0 has to offer over traditional halogen based gobo projection lights. Power consumption. A halogen light takes about 2.2 amps and the Gobo Zoom LED 2.0 only takes .2 amps. Having less draw on an AC power outlet not only eliminates the risk of popping a breaker, it could also be considered an ecofriendly light. Bulb longevity. A halogen bulb lasts about 1,000 hours (41 days) and is extremely delicate. If you bump your light in transit, you end up with a busted bulb. Also, the brightness of a halogen bulb fluctuates with the hours you put on it. 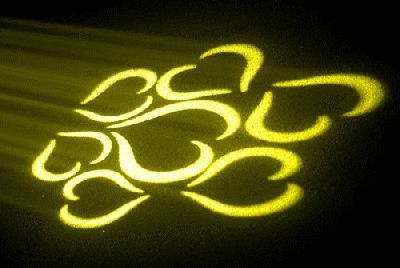 The LED light source of the Gobo Zoom LED 2.0 lasts about 50,000hours . Since an LED light source does not function the same way a conventional halogen bulb does, there is no filament to break or bulb to burst during transit. Also, since the Gobo Zoom LED 2.0 has an LED light source, it means the brightness is the same throughout the life of the lamp. With the Gobo Zoom LED 2.0 specs, it looks like it could be left on continuously for over 5.5 years. Versatility. The versatility of the Gobo Zoom™ LED 2.0 goes beyond what a traditional gobo projector or even the famed Source 4 type lighting can give you. Since an LED light source operates so much cooler than a halogen or discharge bulb, the Gobo Zoom LED 2.0 accommodates more than the traditional steel and glass gobos that give that popular clean crisp image. DJs now have the option of creating their own gobos in house right on their computers with a little creativity, a few easy steps, and a couple of sheets of transparency paper. Weight. The Gobo Zoom weighs in at only 4.4 lbs, half the weight of a PR-1 and an 8th of the weight of a Source 4. A few tips when producing your own gobos for the CHAUVET® Gobo Zoom™ LED 2.0. Make sure you have a newer printer and that it is set to its highest resolution. If you don’t own one, go to a Kinkos or Staples and pay the $3 for them to print it on a transparency for you. Next, go to Michaels or a local scrapers/craft store and purchase a punch that makes paper holes. They have them in all sizes and they should be able to accommodate the 28.6 mm size for the gobo. Having a street price well below the cost of any comparable traditional gobo projectors and just about the same performance, the Gobo Zoom™ LED 2.0 allows DJs to offer an affordable solution for a “name in lights” or monogram upsell with a nice built-in profit margin.